Jose Franky is a Hokkaido born, Tokyo based illustrator and artist. After graduating from Musashino Art University, he worked for Lily Franky as his assistant. Since 2000 he works as a freelance illustrator publishing in various media such as magazines, books and advertising. 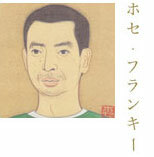 Recently his Artworks were exhibited in Berlin and Tokyo. copyright © 2013- Jose Franky. All rights reserved.